After Jesus Christ was crucified, He was resurrected. This means that His body came back to life and that He will live forever. Because of His Resurrection, we too will live forever. 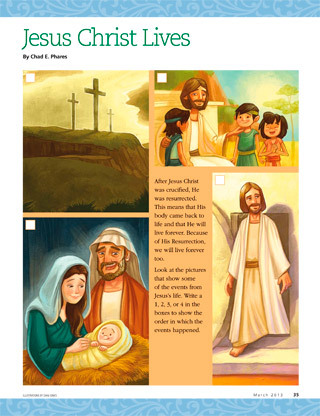 Look at the pictures that show some of the events from Jesus’s life. Write a 1, 2, 3, or 4 in the boxes to show the order in which the events happened.